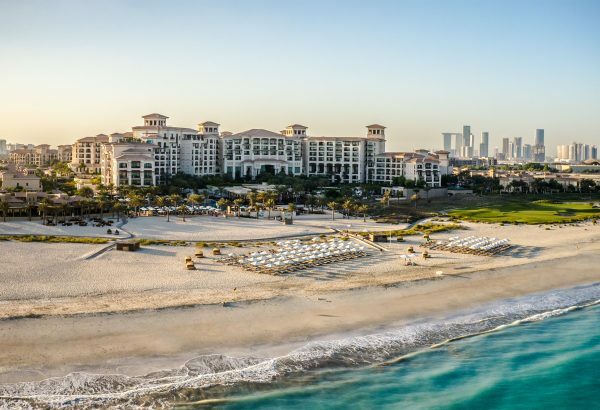 Crystal clear coastline sparkling against a soft white sand beach makes the St Regis Saadiyat Island stand out amongst the throngs of 5-star hotels within Abu Dhabi. The entrée to this Middle East trip was the first class Etihad apartments which took us from London to Abu Dhabi with billionaire-lifestyle amenities one would only dream of: from private butlers, personal servers, a chaise lounge which turns into a full Poltrona Frau bed with sheets and a shower on board which makes your arrival refreshing and chic. For work, I had to take ten days out in the Middle East where I split two days in Abu Dhabi before heading to Dubai. 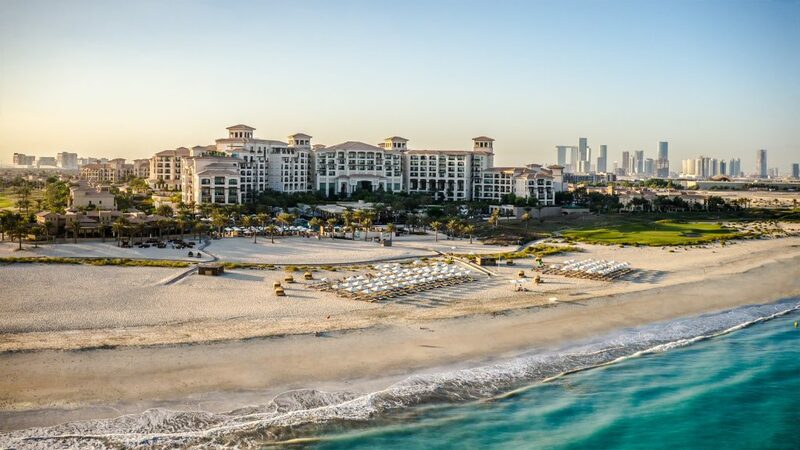 Abu Dhabi is wonderful – with a quieter atmosphere than bustling Dubai yet still showcasing all the bling. The Sheikh Zayed Grand Mosque alone covered in semi-precious stones such as Amethyst, Mother of Pearl, and Lapis Lazuli alone are worth the visit to see the iconic Islamic architecture. 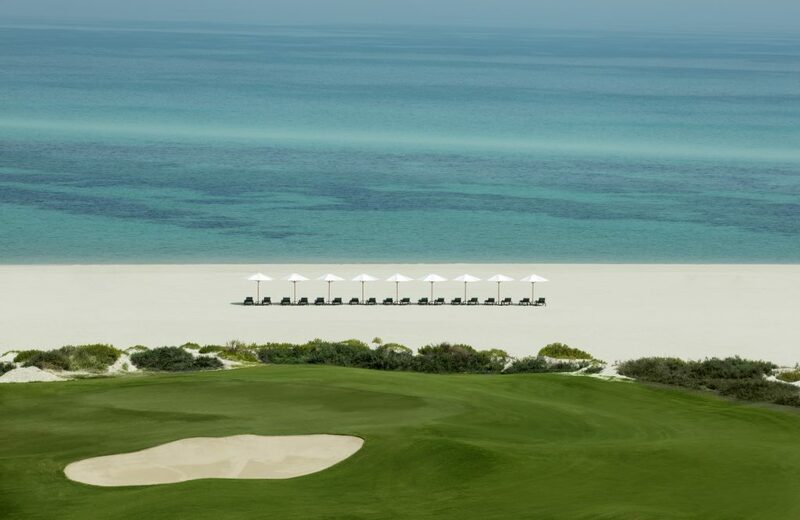 Only twenty minutes away from the Abu Dhabi airport, the St Regis was built on one of the treasured islands Saadiyat (the island of happiness). 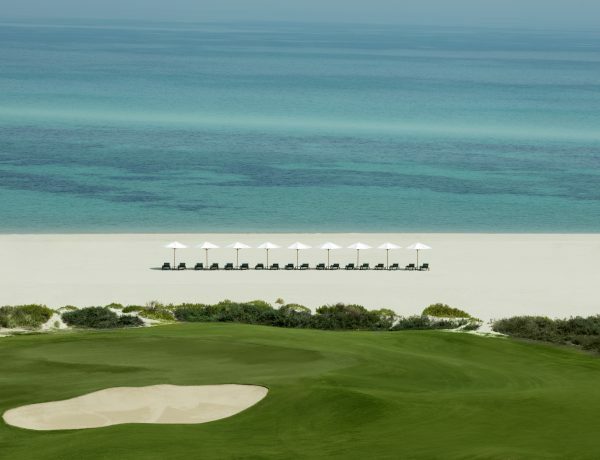 Entering Saadiyat Island is like arriving a prestigious private residence compound as the Island itself showcases grand houses and luxury hotels in an intimate gated community a walk away from the pure white beach. It’s paradise untouched. A friend recommended it to me and described it as “The Maldives of the Middle East”. 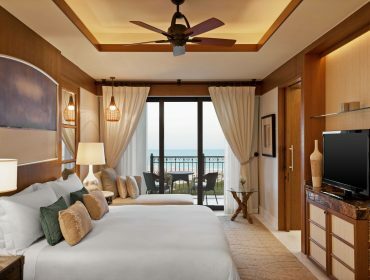 The award-winning resort itself is palatial with heavily staffed entrances and concierge desks ready to respond to your every whim. 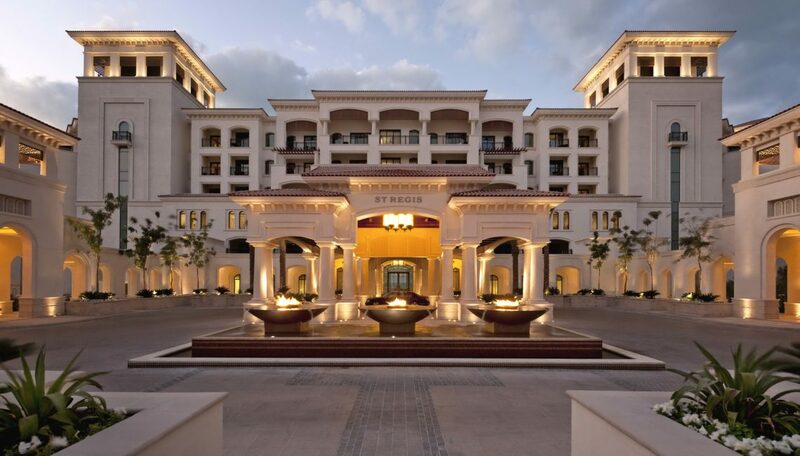 With huge ceilings and spiralling staircases, the Mediterranean-inspired interior design gives the hotel a natural feel even though its impressive grandness alone makes it altogether imposing. The concierge team were incredibly polite, offering us local dates and Arabic tea as we checked in. 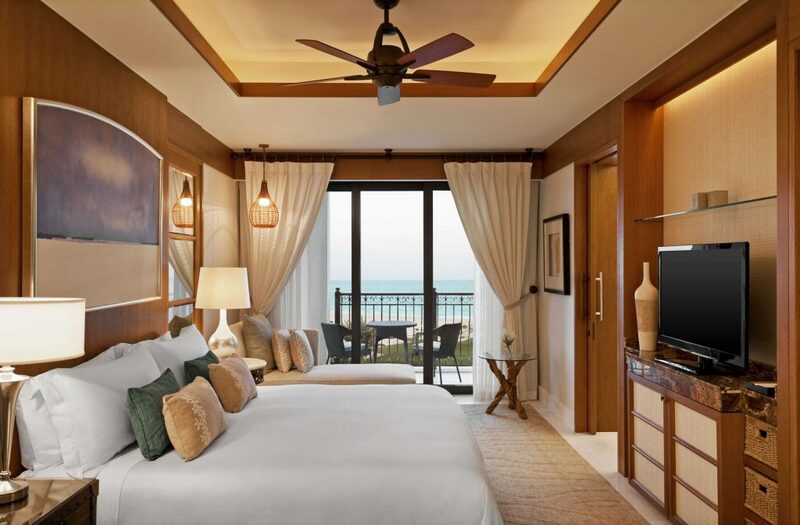 We stayed in a gorgeous Premium Sea View Room with private balcony overlooking the three private pools and expansive private beach. 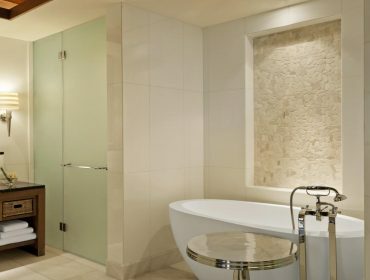 There are his and hers sinks either side of a rainfall shower glassed in between with a white oval stand-alone bathtub in the bathroom. The room was perfectly situated and completely quiet and cut off from the world. 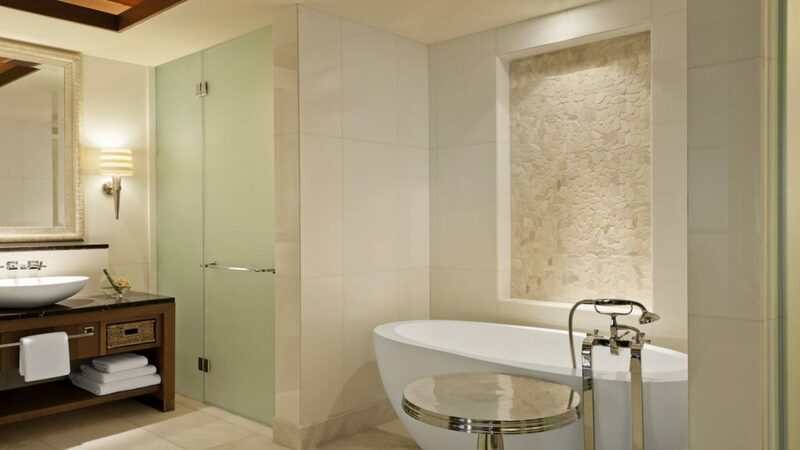 Amenities are vast as the hotel is situated in what feels like a private shopping village with full gym, shops, and five restaurants: Hope Afternoon Tea by Damas, Olea, 55&5th, The Grill, Sontaya, The Drawing Room, and Manhattan Lounge. With so much on offer there is something for everyone and one might never have to leave the resort! 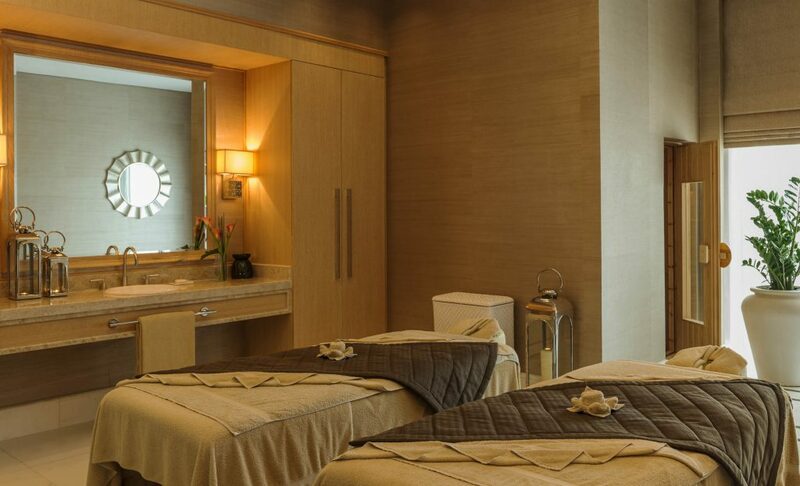 With a supernatural-looking hamman room which is dark, emerald and looks like the night sky, the spa offers a wide range of spa treatments from exfoliation scrubs infused with natural aromatherapy oils, steam baths, massages, purifying body masks, facial scrubs, and hair cleanses. There are twelve treatment rooms and separate ladies and male steam rooms, saunas, ice fountains, whirlpool Jacuzzis, and relaxation rooms. The most impressive unique selling point of this hotel is definitely the private beach which is rare, clear and untouched and worth of my friends self declared title of “The Maldives of the Middle East”.